Featherhead arrived here last summer on his way to the killing cone. Seamus got him as his free (throw away) chick from Murray McMurray. Our oldest daughter Isabel took a liking to him so Seamus gave him to her. That's when his name changed from Wayne Newton to Featherhead. Featherhead had a hard time adjusting to his new surroundings and eventually took comfort in the company of turkeys. After Thanksgiving he managed to make friends with a few hens, and everything was going great for him. Then this summer he started falling off of stuff, and having these little fits. A couple of weeks ago I found him laying on his back with his feet in the air, all but dead. So I helped him out with the transition and buried him in the compost pile. About an hour later I found a hen on a newly hatched clutch of eggs, which almost never happens around here because we collect the eggs religiously. 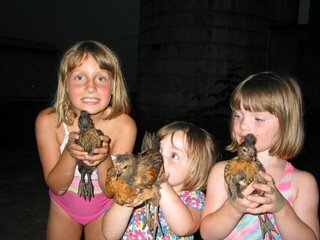 A couple of these chicks are unmistakably Featherheads' progeny. What a great story, bittersweet, if you will. 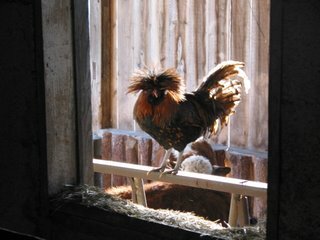 The pic of the Rooster Formally Known As Wayne Newton is super! He appears to be quite the celeb!